He saved my son’s life. I can’t ever repay him. He is the best I could find in 40 years out there looking for the best doctors, the right doctors to do the right thing for me and my body. Dr. Ghosh, thank you from the bottom of our hearts for everything you have done and continue to do for our family. Paul is so blessed to have found you. You healed and treated him and he is on his way to recovery. You saved Paul’s life, there are no words or actions that will be great enough to show you our appreciation. Because of you, Paul will be able to meet our baby girl in a couple of months when she is born. Thank you, thank you, thank you! You are truly amazing at what you do. Dr. Ghosh was very caring and assisted me through every step. He answered mine and my family’s questions very thoroughly. Very attentive after surgery as well. I would recommend Dr. Ghosh to anyone looking for a neuro surgeon. Dr. Ghosh and Amanda were the best physician and PA anybody could ask for. They removed a tumor from my brain and also had to repair a CSF leak and I was told Amanda even held me until I got put under and even during the second surgery, would not let anyone in my family go anywhere else and the office staff was very helpful and treated me like I was a VIP. I think he is #1 in my book. Very professional and knowledgeable. He answered all my questions and made me feel at ease even with the possible need for surgery. I was referred to Dr. Ghosh by my corporate physician. She had heard good things about Dr. Ghosh. I went to several other neurosurgeons. They were all excellent but I just liked Dr. Ghosh’s confidence and frank manner. My surgery was quick and the result was excellent. My recovery time was minimal. The incision, with a little more time will be minimal and not noticeable. The pain I have felt for a long time is gone. I’ve noticed that others feel that Dr. Ghosh and Amanda did not spend enough quality time with them. My time with them was brief. I don’t need alot of hugs and hand holding. I just needed them to provide me with the information I needed to make decisions, which they did to my satisfaction. They are seeing alot of patients. I don’t think it would be fair to others if Dr. Ghosh and Amanda had to spend several hours caring for my psychological needs when all they really needed to do is fix my neck. Amanda is truly capable. I had an issue late on a holiday night. I called. They transferred me to her even though she was at a social event. I explained to her my concerns. She told me what to expect and under what circumstances to come back to the office.For those who felt abandoned and that they didn’t get enough time, you might find other surgeons even more unavailable. Dr. Ghosh stated he was starting to take less patients to try and spend a little more time with each patient. I hope he doesn’t. It won’t be fair to the people who won’t benefit from his talents. A special thank you to Dr. Ghosh and his team. So far I have been taken great care of by Dr. Ghosh and his staff. Dr. G has spent quality time with me reviewing my symptoms and MRI’s etc that are a result of a day at a water park turn into one of the worst injuries I have ever had. What I appreciated the most was our efforts as a team to exhaust all options of pain management and PT before coming to the decision that no relief is in sight without surgery. I had already been referred to Dr. G’s office by other friends and patients so I’m very comfortable moving forward with Dr. Ghosh and his team. 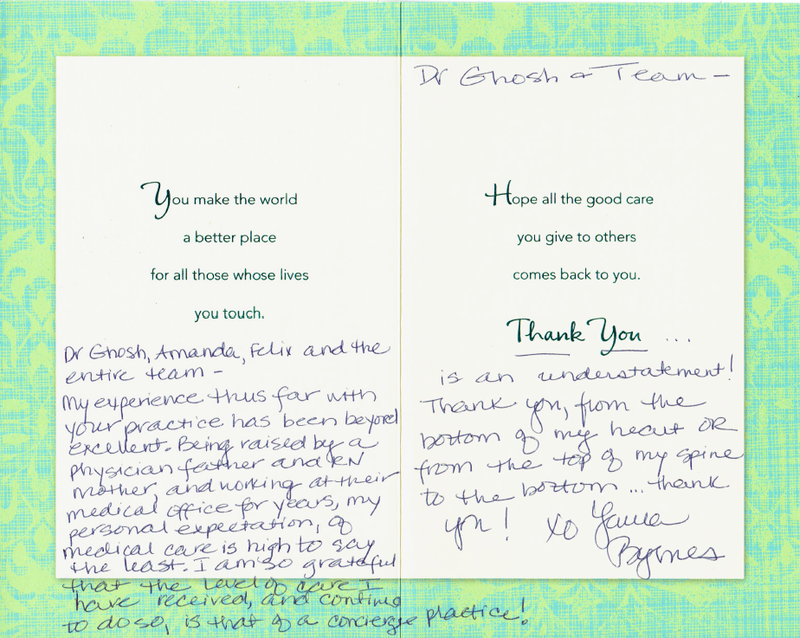 Dr. Ghosh did my husband’s discectomy and he was 100% top notch. He was very thorough, yet conservative and took all the proper pre-surgical steps (therapy, etc.) before surgery. This man saved my life. Difficult surgery, uncertain outcome, but here I am. Before I found your team I was on the brink of going on permanent disability after one failed back surgery and 4 years of hell. I will be forever grateful for what you have done for me, giving me a second chance at life. Nerve pain is a real killer and I was on so many pain pills that I couldn’t think straight, couldn’t work, and my quality of life was destroyed. Now I am back in the game of life 100% and don’t take as much as an aspirin! I had a lumbar fusion in December and was backpacking and did the Whitney trail in late July. It was awesome and I feel good! To Dr. Ghosh, Felix, Amanda and every one of your wonderful office staff, 2 years ago your miraculous talent saved my life. I think of you all every day when I go to work – yes, I returned to work full time! Thank you for doing such a great job with the back surgery on my father. Although cancer was detected, my dad was not in pain with the sciatic nerve. He is now recovering from cancer and feels great! I appreciate your care to help my dad be pain free! I just wanted to take a moment & thank you again for all you have done for my husband, Benton (Rick) Coulter. June 26th he was brought by ambulance to Grossmont Hospital. That was the beginning of the scariest days of our lives. When we were told he needed brain surgery we were stunned, confused & not sure what to do. We asked for a second opinion by you. Within 30 minutes you were at Rick’s bedside. You were friendly, caring & confident. After examining him you told us he would need two surgeries instead of one. You even called me at home to answer our many questions. Thank you for treating us with such respect. You were available & patient as we tried to make a decision. Once we decided you were the right Dr. we had continuous confirmations that we had chosen the right one. We will be forever grateful to you! You saved my husband’s life and his sight. God used you in a mighty way & He answered our prayers. Thank you for all the work it took to be a Brain Surgeon & to help others like us. You are not only skilled but you are also caring. We appreciate you so much.